The kids have been begging to do their own Jackson Pollock inspired art project since attending a family art session at out local library a few months ago. They had a project in mind that promised to be super fun and messy. The beginning of summer break this week presented the perfect opportunity for our Jackson Pollock inspired Splatter Art Project. Jackson Pollock (1912-1956) was a famous American painter and a major figure in the abstract expressionist movement. He is best known for his drip paintings. Pollock challenged the Western tradition of using easel and brush and instead used the force of his whole body to paint. Using Jackson Pollock work as inspiration, we decided to do a splatter art project using our kitchen utensils. It’s one of those projects that I knew needed to be done outside with a garden hose and lots of Huggies Simply Clean Wipes for clean up. 1. Lay white poster board on the ground. 2. Divide paint among cups. 3. Set paint and kitchen utensils out near the poster board. 5. Use Huggies One and Done and Huggies Simply Clean wipes to clean paint off the kids and wipe up messes. Huggies One and Done and Simply Clean Wipes are super versatile. I started buying them when the kids were babies and haven’t stopped. Huggies One and Done wipes are great for heavier messes (paint spills) while Huggies Simply Clean wipes are great for for cleaning hands and faces. Note: Dress your kid in play clothes. Paint splattered on the kids and our concrete patio surrounding the poster board. We use washable paint and this washed it off with the garden hose. You could use a paint tarp, a large canvas, or old sheet under your poster board to protect the area you are using for painting. It can be hard to find projects that work and are enjoyable for all three of our kids, but this one fit the bill. All three kids (tween, school aged, preschooler) enjoyed creating their own unique painting. They have already been asking to repeat this process art project. Make sure to print your $.50 off any Huggies wipes at Walmart and pick up Huggies wipes before starting your splatter art project. This coupon will be available all summer while supplies last. Be sure to check back periodically to print the coupon for use throughout the summer months as you get messy with your kids. 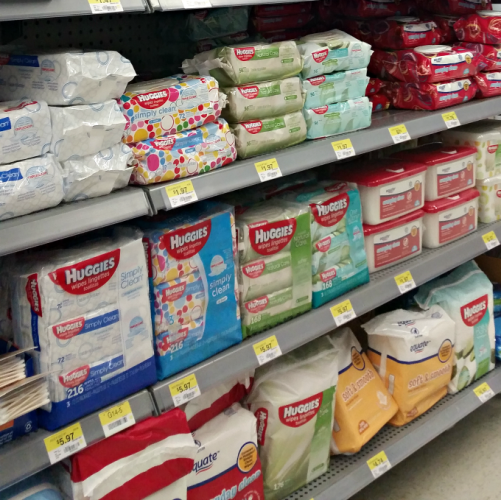 You can find Huggies Simply Clean and Huggies One and Done wipes in the personal care aisle at Walmart. This turned out awesome Kim! Love this idea! I’m always looking for more ways to incorporate art history into my art classes for toddlers and preschoolers! Thank you Jaime! Hope they enjoy it!